Asia's Novelty Act - Me! This orange-clad troublemaker and her friend (taking the photo) got it all started. Notice the ubiquitous Asian “I’m having my photo taken” peace sign. 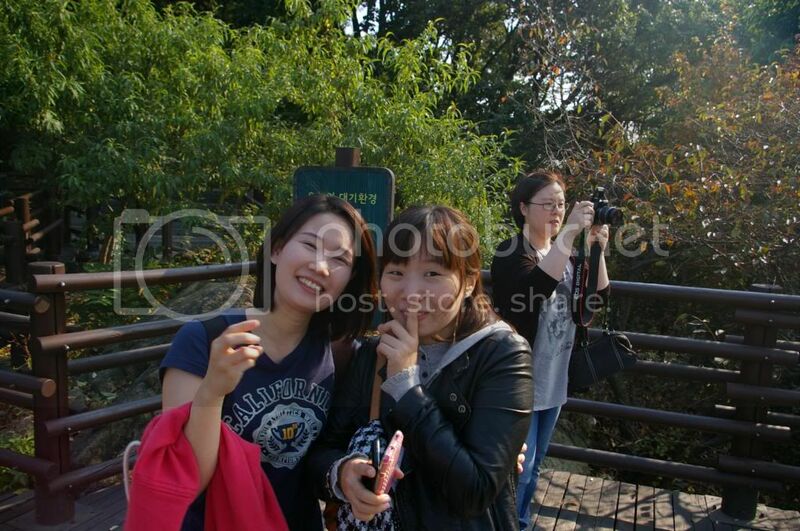 One of my first activities is a climb up Namsan Mountain. Now that’s about 850 feet up, pretty much paved. 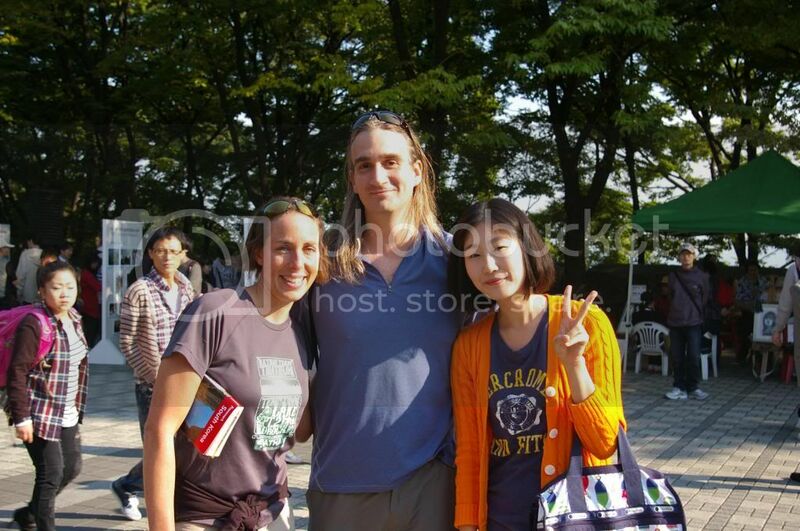 At the top, two Korean women ask me to pose for photos with them. Then I head down … and two more want a photo. Then a young Korean man says “Excuse, please … are you from Italy?” I tell him that I’m from the U.S., and he turns shy and repeats “sorrysorrysorry.” After these two encounters, the rest become kind of old hat, an expected part of my day. And this giggling twosome ramped it up a notch, complete with the soccer-style “sshhhhh” gesture for the camera. At Gimpo International Airport. Soon, I’ll fly to Jeju Island … what people call the Hawaii of South Korea. A college student asks to survey me about my travel experience in South Korea. This will happen every few days. Each survey I take nets me a trinket – a keychain made from lava rocks, a headband with kanji characters (yes, this happened in Japan, too), a handkerchief. It’s the morning of the Hi Seoul Marathon. I’m not up for a full marathon, so I signed up for the 10K. At the starting line, there’s a huge group of runners. Cheerleaders lead us in a boisterous warmup. And I do my own tried-and-true stretch routine … I look up from my task to see a camera crew focused on my every move. I hope they didn’t expect me to be fast or anything. “Why did you come to Korea?” South Korea is friendly – the residents ask us if we need help if we stand in place too long. It’s very endearing. And they want to know why we came to South Korea. And they want to know where else we’ll go. They say “yes” and nod when we say Japan is next, as if it’s more worthy of my attention. Don’t sell yourself short, South Korea – you deserve visitors just as much as Japan.